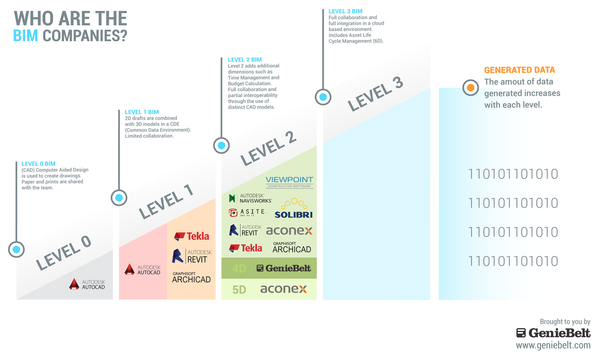 GenieBelt introduces extended infographics and research on BIM, BIM Levels and BIM Companies. COPENHAGEN, DENMARK, June 08, 2017 /24-7PressRelease/ — GenieBelt, the construction management platform, presents some infographics and research on Building Information Modeling (BIM). The article and illustrations bring a simpler and better explanation of BIM, maturity levels and BIM dimensions. In the first infographic GenieBelt explains the difference between different levels of collaboration in a construction project, also known as BIM maturity levels: BIM Level 0 – low collaboration, BIM Level 1 – partial collaboration, BIM Level 2 – full collaboration, BIM Level 3 – full integration. Also, in a nutshell, there are four types of BIM dimensions: 3D – refers to 3D generated drawings; 4D – linked to time management; 5D – concerns data that have to do with the cost of the project; 6D – dedicated to the life cycle management of a building. Among future benefits of BIM for the construction industry, GenieBelt outlines the boost in productivity, handling of big data, possibilities for smaller markets, buildings of higher quality and improved clash detection. In the second infographic, GenieBelt gives an overview with some key company players that are currently an indispensable part of the BIM process and play a significant role in this transition from partial collaboration to full integration. Among them Viewpoint, Aconex and GenieBelt. Access BIM infographics and blog post here. GenieBelt – construction software startup, is revolutionizing the construction industry. One can read all other engaging AEC (architecture engineering and construction) -related topics on our blog. Or book a Demo today to see what GenieBelt construction software is all about.